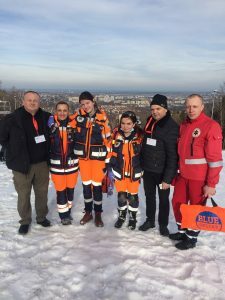 The 13th International Winter Championship of Medical Rescuers (XIII Międzynarodowe Zimowe Mistrzostwa w Ratownictwie Medycznym) took place in the Polish town of Bielsko-Biała on January 23-26, 2018. 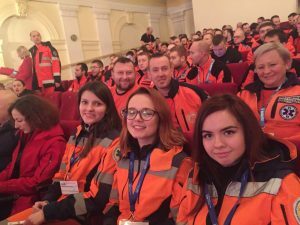 Ternopil State Medical University was represented by a team of students Bohdana Pereviznyk, Nargiz Dzhavadova and Anastasia Hudyma assisted by Head of TSMU Simulation Training Center Halyna Tsymbaliuk and Head of the Department of Disaster and Military Medicine Arsen Hudyma. 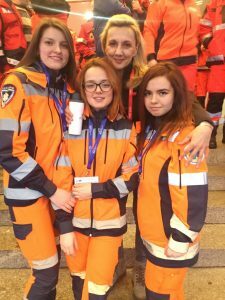 The students had previously won regional national competitions of emergency teams. “We have been participating in this championship since its start. In fact, we were then the first to bring a student team from Ukraine to it. 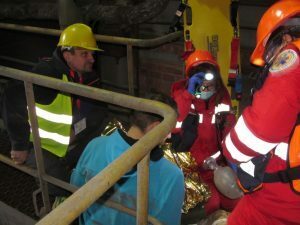 That year TSMU team has placed 12th overall team, ahead of professional rescuers from Italy, Germany, Lithuania and Turkey. 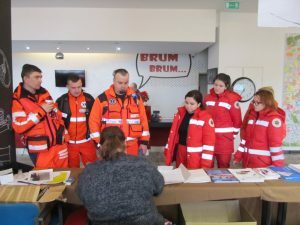 This time our team has competed with paramedics. Participants of this year’s championship were mostly men aged 20-35 with excellent physical training, and outfitted with appropriate medical equipment. 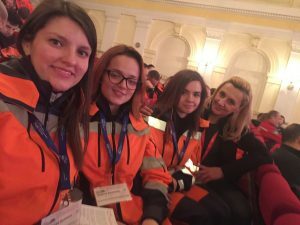 Of the 41 Polish teams, only one was entirely female, and two others had one female team member. Our university has brought a team of three girls. In the very competitive environment, they had to bring it on 200 percent. Our team is the winner of nationwide competitions, so it was time for them to test their mettle on the international arena and for us to show our skills their teachers and coaches. ” said Arsen Hudyma. The team is being trained in the TSMU simulation training center, which has all the necessary equipment. Their coach is head of the center Halyna Tsymbaliuk. Professor Arsen Hudyma took care of the organizational aspects, such as securing an ambulance vehicle and other tools. The competition began on January 23. The tasks were scheduled for both day and night time; in particular, at night, the participants generally got only 2-3 hours of sleep between the episodes. 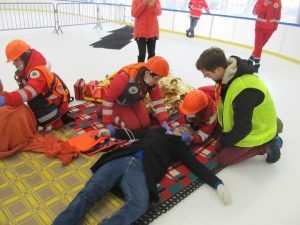 “One of the tasks recreated a situation within an aircraft hangar where a man tore his leg on a screw. The role of the victim was played by a man who really did not have a leg. Participants had to make the right decision on how to help him. There also was a competition testing physical endurance, the competitors had to run up to the 11th floor. Our Nargiz Dzhavadova has successfully completed the task showing a rather good result. She received a special prize for this stage. 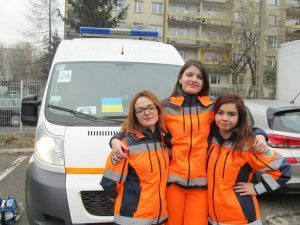 Poland is currently implementing a new dispatch service. A dispatcher plays an important role interacting with different brigades. 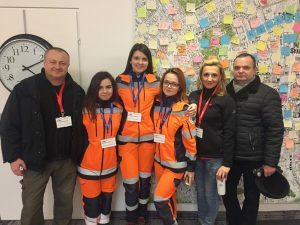 In this contest our team was represented by Bohdana Pereviznyk, who, in Bielsko-Biała dispatch center, listened to the emergency call from the team, filled out the appropriate computer form and selected the brigade closest to the place of call and health facility. It was important to understand the essence of the call and to fill out the form correctly. Bohdana successfully completed this task. 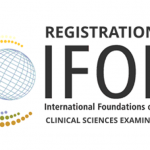 People were impressed that the girl from Ukraine did so well in the competitions” – shared his impressions Dr. Hudyma. Another competition involved resuscitation of a child. This scenario included getting to a mountainous area to help a boy found in the woods by the forester. The child’s the body temperature was 18 degrees. Our team successfully preformed all the procedures. 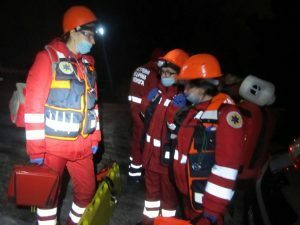 In addition, there were additional points for the ambulance being equipped with wheel chains to access the mountainous terrain. “Next was a competition on the ice rink, where a grandmother was together with her grandson suffering from epilepsy. The boy had an epilepsy episode. Team members had to learn the boy’s history talking to his grandmother, who later has fainted. During the examination, she was found to have low blood level of glucose. The woman needed catheterization of the vein to prevent her from falling into a coma. Our students completed this task successfully. The judges took into account all the smallest details: promptness, correct medicine, its dosage. Bohdana is like our team’s encyclopedia, because she knew all the dosages. 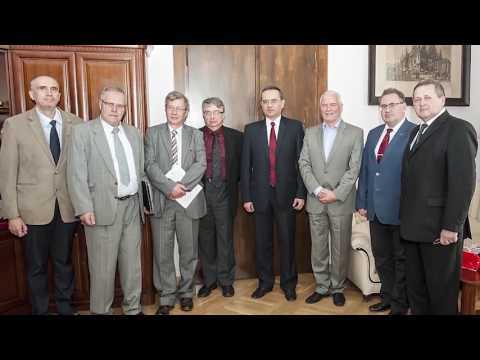 This brought us additional points”, said professor Hudyma. An interesting and extremely realistic competition scenario was the “Explosion on a Thermal Power Plant”, which actually took place in a real power plant. On the small balcony at the height of almost 4 floors there were two wounded persons, one of whom needed urgent intubation. 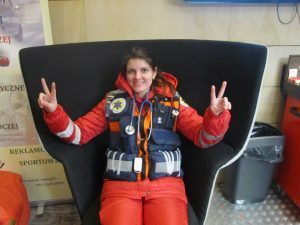 In this task, Anastasia Hudyma showed excellent skills and knowledge, intubating the patient quickly and correctly. The judges noted that it was one of the fastest intubations during the competition. Also, the size of the tube was taken into account, since the patient had burns of the upper respiratory tract and swelling of the mucous membrane. 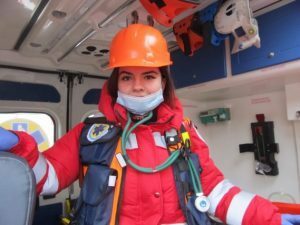 During the intubation, Anastasia talked to the other power plant employee, who was very worried about his colleague. She was able to quickly diagnose another problem, prompting our team to call for an additional ambulance and get extra points. These competitions were exhausting, because there was practically no time for rest. 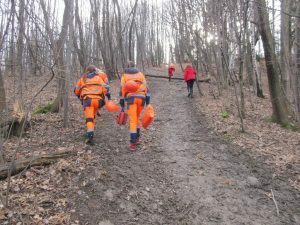 Immediately after a night task with massive casualties, in the morning n our students had another difficult test – walking 1.5 kilometers along the forest path on the 45 degree incline. Our girls overtook the team that had started 5 minutes ahead of them and eventually showed the second overall result. Once arrived they had to completer a cardiology task. In it, an athlete got critical bradycardia and lost consciousness. 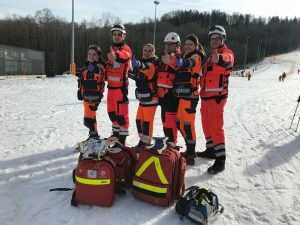 It was necessary to revive him using defibrillator and to call a brigade of mountain rescuers to bring him down to the foot of the mountain where a cardiology emergency team was waiting for the patient. 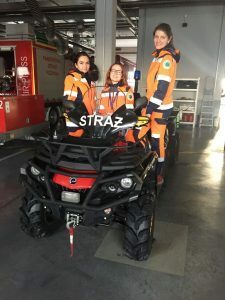 “It has to be said that during the championship, we saw the differences in some aspects of paramedic emergency assistance in Ukraine and Poland. 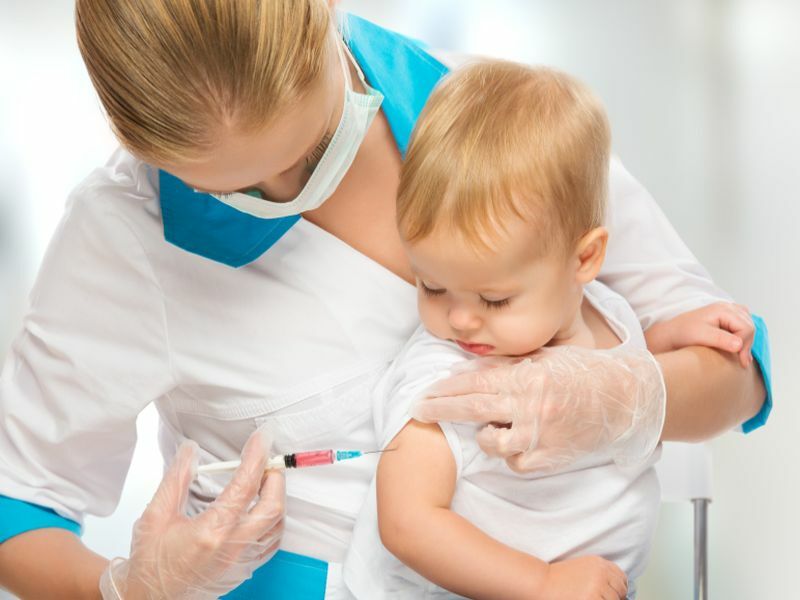 They do not bother with alternative approaches; they use simplified actions that, from the point of evidence-based medicine, are more effective. 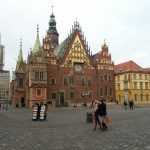 I want to point out that in Poland, they quickly implemented the latest advances of the emergency medical care recommended by the American Association of Cardiologists and the European Council for Resuscitation. So far, these changes and recommendations have not been fully implemented here”, emphasized Arsen Hudyma. 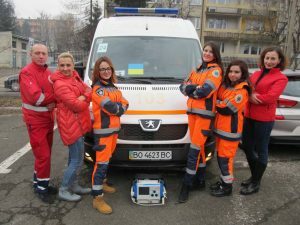 Four other Ukrainian teams participated in the competition, including representatives of Ivano-Frankivsk and Lviv emergency medical centers, Kitsman Central District Hospital and TSMU, as well as a team from the Lithuanian city of Kaunas. 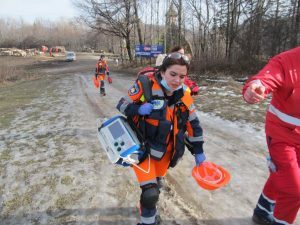 In the end, Ivano-Frankivsk took the first place among international teams, while TSMU doctors-in-training were second. 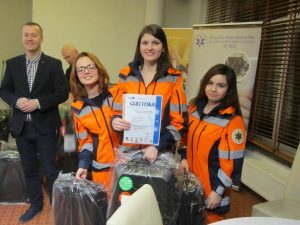 Incidentally, they were the only student team that has been competing during these days with emergency professionals. Our team has lost to the leader by only 9 points. “One of the requirements was the use of radios. Our team had to use mobile phones because we did not know about this requirement, so we lost a lot of points because of it. We can confidently say that our team of students is rather strong and professional, even without having practical experience. 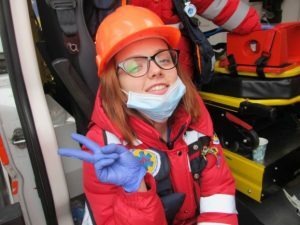 The girls have acquired solid knowledge and skills at TSMU simulation training center. Last time I personally took part in such championships was in 2011 and 2012, but then the teams were required to have different level of experience, without significant physical demands, and had different ages and more women. This time, when I entered the registration hall, I started to worry about our team, because I saw who was on the teams and competition requirements. In just five years the participants and technical requirements of the organizing committee had substantially changed. 90% of the competitors were 180 cm tall men with excellent physical fitness. Our girls did well. They practically had a 24-hour shifts and emergency calls for three consecutive days without proper rest. 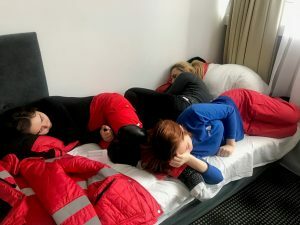 Incredible physical fatigue, stress, emergency field conditions – these were some serious challenges our students had to deal with. TSMU team received thunderous applause during the awards presentation. 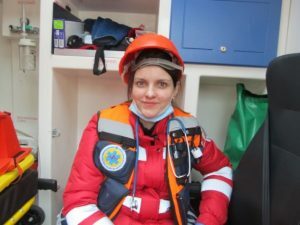 Of course, later we discussed with them every stage and their actions, so that they understood what they have achieved and did not lose their fighting spirit in the future”, concluded Halyna Tsymbaliuk.